« *** WINNERS *** Carmen, Lacey, Stacey and Ashley are Living the Life of Riley! CONGRATULATIONS! Celebrate Memorial Day Weekend with Step2! To celebrate our American heritage, every (yes, every!) Step2 item ships FREE now through Monday, Memorial Day (5/28). No coupon coded needed. Free shipping is reflected on the product pages. Not valid on Canadian shipments or Infantino items. In addition, the Weekend Deal started one day early this week. The Grand Walk-In Kitchen is just $188 + FREE shipping with coupon code S2GW512 now through Monday, Memorial Day (5/28). That’s over $70 off the original price! 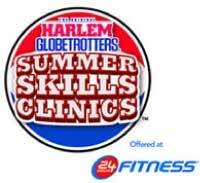 Harlem Globetrotters Summer Skills Clinics Coupon Code ~ Save $10 to the Hottest Basketball Clinic in Town!